Not only do the new Axis Q35 cameras offer 60 fps video capture, wide dynamic range and edge recording amongst plenty of other features, the particularly interesting thing about these recently launched cameras is that they are the first Axis network cameras to offer both HD 1080p / 2 megapixel and Lightfinder technology. In the past we have only seen HD 720p /1 megapixel cameras with Axis Lightfinder. However advances in technology are enabling even higher quality low light image capture. 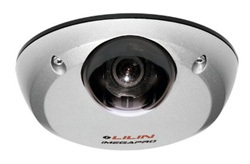 During 2012 we have seen HD 720p cameras below £200 being launched into the CCTV market. Axis, Panasonic, Sony, Vivotek and Lilin all joined the frame. The rapidly, ever improving, price v. performance ratio in the world of IP cameras is great news for CCTV users. 2013 has only just started and we have already seen the first HD 1080p camera dropping below the £200 mark. The trend of 2012 seems set to continue in the coming year. 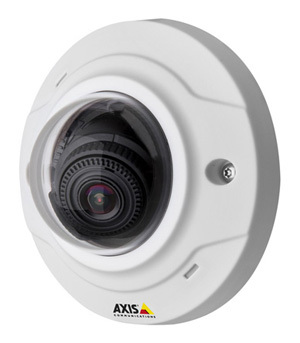 Axis’ Lightfinder Technology, thus far only available in its top end ‘Q’ range of products, is now becoming available within the P33 range of IP dome cameras. This is good news as many installations will benefit from improved performance at night. Axis has released two new cameras to its existing M30 camera range. The M30-V series are small enough to fit in the palm of your hand, ideal for unobtrusive surveillance, and are vandal-resistant for mounting in exposed locations. The integrated recording system helps to lower system costs with video stored either to MicroSD memory cards or local networked drives. 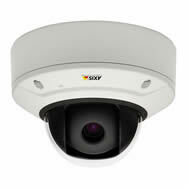 Axis Camera Companion support offers easy viewing and management of up to 16 Axis IP cameras. The M30-V cameras are available in two resolutions; the Axis M3004-V offers HD 720p video and is available at £186, while for £259 the Axis M3005-V produces HD 1080p footage. With this price point and level of functionality, the M30-V IP cameras, like others in the full Axis camera range offer exceptional value. Axis have released the latest addition to their P55 pan-tilt-zoom range, the Axis P5544. 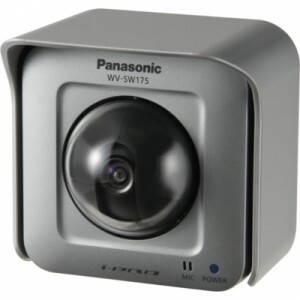 Like the rest of the range, the P5544 features 18x optical zoom, day/night switching and IP51-rated casing. Where this IP camera differs is in the addition of a second lens to the base of the camera dome. This additional hemispheric lens covers a full 360° view, letting viewers see footage from all around the camera at once. The video below shows the camera in action. 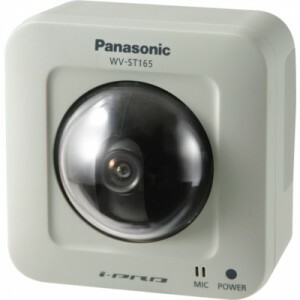 Hot off the production line, here’s a sneak peek at Panasonic’s replacement for their popular BB-HCM715; the i-Pro WV-ST165 pan/tilt IP camera. We’ve unboxed the camera to show you what to expect. The Panasonic BB-HCM715 and BB-HCM735 will soon be discontinued. Their successors are part of Panasonic’s i-Pro professional series, offering an improved feature set. The BB-HCM715 will be replaced by the WV-ST162 and WV-ST165, providing SVGA and HD720p resolution respectively, while for outdoor environments, the WV-SW172 and WV-SW175 replace the BB-HCM735, coming with IP55-rated casing.